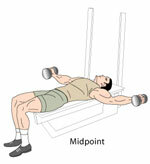 The Workouts Database provides you sample workouts routines by Body part. Pick a workout and run with it towards your Weight Training Goals now. P.S. - This is the Workouts Section. 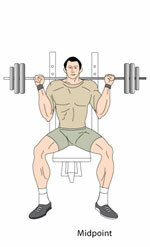 If you need to learn correct Exercise techniques by Body part then visit the Exercise Database. In the Weight Training Workouts Section I provided you with best 3-day, 4-day and 5-day Workout Routines. Here I will give you a list of Workouts by Body Part. 10 Minute Workouts, 20 Minute Workouts and	30 Minute Workouts - Check them if you are in a hurry. Why not share your favorite Killer Workouts with Us? Do you have your own Weight Training Workout proven to work for you? Why not share it with us and help others reap similar rewards from your workout. Your story will appear on a Web page exactly the way you enter it here minus any spelling mistakes of course. Click below for more workouts and user tips. 1. After a football workout what should I eat? The best after workout meal includes protein, carbs and fat. This type of meal provides needed nutrients to the muscle for the repair process. 2. How many minutes a day should I do a Rebounder workout ? The best workout is ten to thirty minutes a day. 3. What to eat before a workout? Before a workout you need to focus on hydration. You can eat something so your stomach isn't empty but keep it light. Focus on drinking enough before the workout and save the food for afterward. 4. Can you workout your upper body after pitching? You should workout for best results right after a game. Just use lighter weights than you would during the off season. 5. Is using stationary bike a good workout? A stationary bike is a great workout that builds cardiovascular health and helps strengthen the leg and core muscles. It also helps with the tricep muscles. 6. How much will steroids reduce workout recovery time? Steroids can help because when using them you never reach full muscle fatigue, so recovery time is minimal. 7. How to keep a workout journal? A workout journal can be kept on your computer or in a notebook. Use it to record your weight, diet, workouts and feelings. You can track your weight lifted, repetitions, endurance tests and other information so you can see how you are progressing. Record anything that is helpful to you in your progress in your workout program. 8. How soon after my workout should I drink my protein shake? The shake should be drank right after a workout. 9. After a weight training workout is sugar good for you? Carbohydrates, like sugar, are good after a workout. However, it is healthier to get the carbs from whole grains rather than sugar. 10. How to create a weight workout plan that targets every major muscle ? A full body workout should target the arms, legs, chest, back and core. Find exercises for each body part, gather the right equipment and create a plan that works smaller muscles first and large muscles last. 11. Are workout supplements actually beneficial? Workout supplements can help ensure your body gets the nutrients necessary to prevent energy loss and to boost muscle repair. 12. Can you do full body workout 3 times a week? Three times a week is too stressful for the muscles, so stick to a maximum of two times per week. These questions and answers are things many people may wonder about. They are questions that may come up when you are deciding on what weight loss program to follow. Now that you have these answers you may be able to better create the weight loss plan that works for you.